More than one billion people globally are making a life outside of the formal labor market. This paper draws on original research in South Africa to argue that many people are making a life outside of the market in accordance with a set of values which fundamentally contest core assumptions embedded in dominant discourses about the relationship between learning, labor, and having a good life. People we spoke with argued that their making a life was characterized by concrete labor (or doing) and radical humanism and saw these elements as constitutive features of their well-being and instrumental to their well-being improvement. This chapter shares this research, explains the making a life framework, and then draws on this framework to explore its relationship with human agency and capability. In this exploration, the chapter notes that while structural perspectives often emphasize the (very real) agency-freedom constraints facing poor and working class people, a making a life framework demonstrates the inherent agency and humanity expressed by people enduring often extreme hardship and importantly offers a new perspective for interpreting human agency – inclusive of the self-defined efforts of people to make their lives own better and on their own terms. Formal vocational education and training not only does not help; it actually harms a large number of people. A “making a life” framework built around the concepts of concrete labor, radical humanism, and caring can be used to understand how the more than one billion people living outside formal labor markets take care of their own well-being, needs, and interests. The “making a life” framework draws on theorizing presented in Baatjes (2018). Capabilities scholars could draw on the “making a life” framework to broaden their understandings of human agency, as well as understandings of the conditions, circumstances, and ways in which human potential, in its varied manifestations, unfolds. The preponderance of scholarship on VET policy and practice is grounded either in human capital and productivist logic or, alternatively, a full-throated critique of dominant paradigms. Critics of productivist logic have found it analytically useful to situate and understand VET within the broader social and economic structures in which it is located. Such contextualizing has resulted in scholarship identifying the rigidity of class structures and the extent to which social structures and unequal power perpetuate class inequality and relegate, in many countries, vocational training and manual labor to second-class and lower-income status (Vally and Motala 2014). However, if this frame of reference and model of social relations are taken as static, one seems to face either an analytical cul-de-sac (e.g., scholarship promoting TVET for class mobility within an inherently unequal set of social relations) or is forced to make naïve claims about the potential of VET or human agency to transform structural poverty, inequality, and joblessness. Notably, the failures (and rejections) of capitalism have created new material and analytical spaces – labor taking place outside of formal markets – that can be drawn on to develop new understandings of human labor and, concomitantly, new expressions of human agency and human potential. These interstices (Holloway 2010), or rather, what is happening in them, are the focus of this chapter. This chapter draws on data collected during the Emerging Voices 2 (EV2) research project. The project (described in the next section) reached people in over 20 poor and working-class communities in rural and peri-urban areas in South Africa. People we spoke with told us about what mattered to them and how they met their human needs on a day-to-day basis. People told us about their concrete labor, that is, their activity which met their human needs and was measured in its use value. Peoples’ lived experiences and their reflection on their experiences conveyed a radically human orientation, that is, a privileging of humanity, investment in interdependent and caring relationships, and resistance to oppressive forces. What we learned through this research was an orientation to “making a life” and “well-being” that was significantly different from the normative model conveyed in modern capitalist society and conveyed through formal institutions of education. These findings matter for two reasons: (i) productivist economic and educational paradigms have not and are unlikely to resolve poverty, unemployment, and inequality and (ii) the share of people and families making a life outside the formal labor market accounts for one-fifth of the world’s population. In South Africa, nearly half of South African families live below the poverty line, and unemployment, using the broad definition, is equal to 37%. Youth unemployment is much higher at 67% (Stats SA 2017). Finally, South Africa has one of the world highest levels of economic inequality. These indicators remain little changed in the two decades following South Africa’s transition to democracy. More troublingly for human capital adherents, higher levels of educational attainment and TVET certification in the general population do not appear to have addressed unemployment and poverty and joblessness in rural or urban areas. Nearly 50% of South Africans live in informal urban settlements or rural and remote areas, and over 20% of the labor force is “informally employed” (Stats SA 2015; Wills 2009). At a global level, nearly two billion people, almost one in five people, work in the informal sector (Neuwirth 2012). Based on our research, efforts to formalize (from a social, economic, or educative perspective) so-called informal labor arrangements amount to the misapplication of a normative model to phenomena that is, by structure and definition, positioned outside of the dominant logic of markets and formality. For the medium term at least, widespread exclusion and massive informal labor systems will continue to be a daily lived experience for nearly 20% of the people on our planet. While the EV2 research elicited new ideas and perspectives, this chapter does not in any way seek to romanticize the lives of the people with whom we spoke. People we spoke with talked about the material hardships of poverty, including hunger, ill health, and insecure living conditions; poor access to basic services; and insecurity, powerlessness, and loss of hope. However, in sharing how they “made a life,” people also spoke of the extent to which human needs, interests, and relationships shaped their labor and daily lives. This chapter elaborates on the three arguments outlined in the first paragraph and, based on these arguments, reflects on possibilities for agency- and capabilities-related thinking in a “making a life” framework. This chapter does not suggest that research findings in any way resolve critical issues facing formal VET. Instead the chapter hopes that information shared limits the harm inflicted by education and opens new spaces for thinking about more humane living and the labor which sustains it. This chapter draws on data from the Emerging Voices 2 research project: a 3-year project funded by the Department of Higher Education and Training in South Africa and implemented by the Education Policy Consortium. Research was conducted by three university-based research centers (the Centre for Education Rights and Transformation at the University of Johannesburg, the Nelson Mandela Institute at the University of Fort Hare, and the Centre for Integrated Post-School Education and Training at Nelson Mandela Metropolitan University) and the Centre for Education and Policy Development. The purpose of the research was to reimagine post-school education (In South Africa, the term post-schooling refers to post-secondary schooling and can include university, TVET, and adult education and skills training.) so that it would better serve the needs and interests of poor and working-class communities in South Africa. In addition to interviewing and holding dialogues with students and staff in VET colleges, universities, and Adult Education and Training (AET) centers, the research team also visited several large number of informal education organizations and organizations in which nonformal learning took place (Baatjes 2014) and conducted workshops in communities to get a better sense of how people solve the daily problems and challenges that they face in different parts of South Africa. TVET colleges are regularly described as “dumping grounds” – a characterization to which, unfortunately, education officials contribute. During the period of the EV2 research, Mathanzima Mweli, the director general for the Department for Basic Education, stated that the rationale for the introduction of a Grade 9 leaving certificate is for “those learners who have mild to moderate intellectual disability and who can’t go beyond Grade 9 academically” (SAFM 2015). This argument was drawn on to justify efforts to direct “slow learners” into secondary-equivalent courses at TVET colleges. Unfortunately, because many of the costs of attending TVET colleges are shifted onto students, a large share of students enrolling in TVET college do not complete a degree – leaving them with neither a secondary certificate nor the TVET college equivalent. Many youth and adult learners, identified as failures multiple times, and observant of the fact that their academically more successful peers have access to better resourced, better run, and better respected educational institutions, indicated that they begin to believe that they may be “less than” or become depressed about being able to change their own future. For first-generation college graduates who are not able to find a job, the feeling of failure may hit especially hard as family members helped pay for higher studies and expected them to get well-paying jobs. Recent graduates from poor and working-class backgrounds who do find jobs often struggle with high levels of student loan debt and expectations of supporting extended families. Many people we spoke with provided an incisive analysis of their dilemma but also great difficulty of identifying an alternative. People recognized that high structural unemployment (including ongoing retrenchments in manufacturing and mining industries) meant that their chances for finding a job were slim. As a result, many were drawn to further education and certification as a means to improve, if only slightly, their competitiveness in the labor market. People identified “giving up” as the only alternative to participation in education. It was only when we stepped outside of “formal” spaces that alternatives were identified. It was people outside of the formal system who identified the extent to which people (in formal education) were schooled into someone else’s logic of what it meant to make a life – part of which included being dependent on someone else to give you a job. (Peter Hessler, in reflecting on teaching at a University in Fuling, China, thousands of miles away makes a similar observation; he writes of a conversation with an uneducated Chinese worker, a photographer, “I realized that as a thinking person his advantage lay precisely in his lack of formal education. Nobody told him what to think, and thus he was free to think clearly (Hessler 2001 p. 173) …the more I thought about this, the more pessimistic I was about the education my students were receiving.”) An adult educator we spoke with said that we need to eradicate the mentality that “I must go to town to be employed” (Adult Educator, Gauteng). Students we spoke with talked about how their experiences of going to school iteratively distanced them from their past and their lived experiences. Upon returning to their communities, they found themselves unable to relate to others and often became reliant on others in order to be able to meet their basic needs. Ironically, for these students, formal education and the expectation of the results of formal education (i.e., a job and a paycheck) created in them a dependency on others which did not exist previously. One interviewee recounted, “this mother in the township is selling fatcakes and sending all her kids to varsity… and some of those kids are coming back home and living with her” (Local Activist, Orange Farm, Gauteng). Of course, many students have also benefitted from their participation in VET and AET education in South Africa. TVET colleges reach over 700,000 students in South Africa: many students benefit from their participation in TVET college courses. For example, Powell (2012) and Needham and Papier (2011) offer recent positive examples of VET improving the lives, agency, and aspirations of youth and adults from poor and working-class communities. However, the EV2 data show that VET and AET also harm a large number of youth and adults in South Africa. As this chapter will later argue, one of the greatest harms is the extent to which formal schooling appears to construct in students a narrowed and diminished agency capacity and, because of this, a truncated understanding of the fullness of human potential which could be developed. The distinction between concrete and abstract labor was evidenced time and again in our research with formal institutions and systems and informal, outside the market, organizations. While many students and young adults offered humane reasons for their interests in particular areas of study or job, they were, time and again, confronted with the inhumane logic of the market. The job market hired less-qualified workers who could be paid less and more easily fired; students, desperate for income, sought any form of job, regardless of whether it spoke to their interests, and we came across many examples of people who held onto jobs that made them sick or depressed rather than follow an alternative path which could promote different forms of well-being. The common thread in the life stories people shared with us was the extent to which they privileged the exchange value of their labor over other human needs and priorities. Alternatively, it was from people and organizations operating outside the market, where labor was more closely connected to meeting human needs and where people did not make the distinction between working and making a life: they were simply making a life, with their doing a constitutive part of the whole. Many people we spoke with talked about the care and attention they put into their daily activities: they saw themselves as enmeshed in structures of care and interdependence and, from their experience, identified a new (old) humanizing logic for making a good life. Holloway argues that doing exists “within, against, and beyond” capital and that doing is a part of our ontological nature. Doing is expressed within experiences of abstract labor, pushes against alienating labor to construct meaning/combat meaninglessness, and, as identified above, is expressed in the absence of market logic and forces. An approach to living and learning that recognizes “doing” as an ontologically fundamental, and fundamentally human impulse, could allow for new thinking in VET and application of capabilities thinking. What people told us also conveyed elements of radical humanism. A radical humanism philosophy privileges humanity (human beings, human needs, human interests), recognizes the collective rather than individualized nature of being human, and is active in its struggle against the oppressive social relations to, in the words of Fanon, the “right of every person to be a person amongst other people” (Fanon, qtd. in Pithouse 2011). Theorizing on radical humanism draws largely on postcolonial literature, including the work of Fanon. Neville Alexander, writing on “racial capitalism” in South Africa, and Fanon, on the colonial experience in Algeria, both identify “being dehumanized” as one of the central experiences of living as a person of color under colonial structures. A radically human philosophy rejects individualized conceptualizations of humanity and instead argues that the collective struggle against oppression is one way of reclaiming humanity. People we spoke with were not ignorant of their own oppression and dispossession. Many people we spoke with, drawing on their lived experiences, offered an incisive critique of neoliberal policies, capitalism, and development. Neoliberal capitalism bred joblessness, inequality, and insecure living and working conditions and perpetuated dehumanizing and undignified conditions in work and life. So-called “development” was the spreading of a mythology and programs which often benefited the elite and enriched the powerful at the expense of the poor. Development was bulldozing informal settlements because land was sold to “develop” middle-class housing in Port Elizabeth; development was the perpetuation of a severely unequal schooling system. People routinely observed the contradiction of government claims toward solving unemployment amid ongoing retrenchments in manufacturing and mining industries and structural labor market changes related to the displacement of labor by capital and the increased casualization of work (Hlatshwayo 2014; Balwanz and Ngcwangu 2016). For many people, the path toward a radically human philosophy came from their rejection by the dominant system (e.g., dispossession, unemployment, low power status) or, alternatively or concomitantly, their rejection of the dominant labor market model. Baatjes (2014) among others identified a large number of movements, collectives, and community organizations organized around community needs, drawing on community capabilities (see Powell 2016) and expressing radically human values in their work. Even outside of formal organizations, people we spoke with who were living outside the market routinely privileged discussion on human needs, interdependence, and caring and, often in routine but meaningful ways, rejected the oppressive relations fostered by market living: people grew their own food, worked their own hours, sought connection to or were involved in maintaining local culture, and made more decisions for themselves about what they needed to do and what was important to them. Like “doing,” a radical humanist positionality does not seek to “solve unemployment” or provide comment on promises or critiques of a human capital orientation. Rather, we can use the lens of radical humanism to understand how people actually make their lives and define and find well-being in the midst of economic and social hardship. People we spoke with told us about the values they expressed or hope to express in their lives and futures – people sought equality, ubuntu, and dignity; several organizations were oriented toward social justice; others were simply organized around local capacities and needs related to health, care, education, food production, or small-scale service and goods production for income. Holloway’s conception of “misfitting” helps describe what we’re seeing. Holloway notes that misfitting is a “constitutive element of capitalist society.” Holloway continues, “if we did fit in completely and were completely dominated by abstract labor and capitalist reproduction, then we would no longer be human” (Holloway and Susen 2013). Here Holloway helps us to connect the incongruity between dominant discourses and formal experiences of people and the lived experiences of making a (good) life which people told us about. Education harmed a lot of people we spoke with, in part because education was premised on an inhumane market logic that was practically and experientially repulsive to many people, “misfits” so to speak. In moving outside of the market, many people gained or regained their capacity for “doing” and the (re)construction of their humanity ontologically linked to use-value activities. Similarly, people’s work and, bluntly, economic and social vulnerability fostered an expression of radically humanist values: their activities took on an assertion of being and humanity, in part because of the dependence of life on them. So what does this matter to scholarship on capabilities and VET? I think … tertiary education …to be a civilised way of slavery. It teaches on how to build another person’s dream rather [than] to teach one to actually make use of the resources around them so that they can adjust a very independent living. (University student and YRLA researcher, Eastern Cape). We tell them [youth] this is your future. No one is going to live it for you. You decide. (Founder, Youth Development Program, Gauteng). 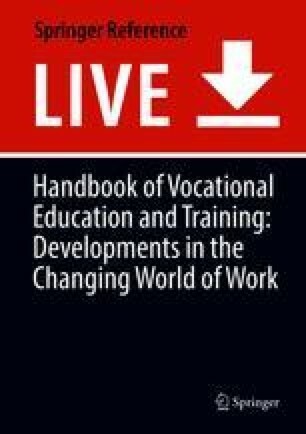 This section of the handbook challenges authors to discuss how capabilities perspectives could inform policy and practice in vocational education and training. I draw on the making a life framework and focus my analysis on the issue of agency to make three observations. First, I argue that we need to understand the agency to be mediated and shaped by context and social relations. The making a life framework offers a different social field for conceptualizing agency and its varied expressions – as well as framework for making a comparative analysis of agency-suppressing features of dominant social fields. Second, contrary to some strands of capabilities thinking, I argue for a definition of agency which places less emphasis on “deliberation” and “purpose” and better appreciates the lived, present-based, experience of doing. To conclude this section, I argue that educators and scholars ignore structuralist critics who mostly emphasize what is not possible within a predefined and restrictive model of social relations, step outside of capitalist spaces and logics, and do whatever is in our power to promote the expansion of human agency and thereby the unfolding of human potential. A fundamental contribution of an agency-focused capabilities approach to scholarship on human development is that the approach places agency, one’s capability, and the scope of this capability to act at the center of conceptualizations of human development. (In this section, I draw largely on the scholarship of Sen and Crocker on an agency-focused capabilities approach.) Capabilities approaches, which promote a normative perspective on human development, are often paired with a theoretical perspective for understanding social reality. The same must be done for understanding agency. Recent scholarship in comparative and international education, drawing on critical and sociological perspectives, understands agency, one’s capability to act, to be dialectically related to one’s spatiotemporal social context (Emirbaryer and Mische 1998) and mediated by the norms and rules of the social fields in which human relations are enacted (DeJaeghere et al. 2016a). Our agency-space, the socially constructed space in which we are (and imagine ourselves to be) capable of acting, and the constriction or expansion of that space are necessarily grounded in and mediated by our material and socially constructed contexts (Balwanz 2015). Recent scholarship related to young adult participation in work and livelihood education programs in East Africa argues the agency to be ontologically positioned in relation to others – that human agency cannot be understood outside of an understanding of one’s social relations (DeJaeghere et al. 2016b). (It is worth noting that this research contests the pervasive individuating logic of capitalism and formal education while at the same time suggesting that the ability (and structural interest) of capital to weaken human agency and social relations explains the resilience of capitalist structures.) I’ll argue later that this conceptualization of agency has implications on how we understand the expression (or suppression) of agency in different social spaces. Put another way, “action happens.” Our action needs not necessarily be purposeful or the result of our reflective intelligence. Sometime, this is the case, and, as good educators, we hope that actors engage in reflection, post-action. A second observation by Emirbayer and Mische (1998) is that, even in post hoc analysis, our instrumental and existential rationales for (or understandings of) action are analytically inseparable. (In some instances, agency that is overly projective in nature and (see Frye 2012) also privileged instrumental rationales, which in some contexts truncate present expressions of agency.) Both observations broaden the conceptual space for understanding of human agency and, I argue, place a greater emphasis on freedom of action in a non-self-conscious present, in which the oppressive rules, norms, and social relations constituting social fields fall away. Research from Balwanz (draft) on three holistic youth development programs argues that the social fields created by the programs create spaces where youth, in the words of one participant, feel “good and free because I can be able to express myself and talk about reality.” Often, it is not in the moment, but after it, that people realize that they have done something. Some of them think, maybe I could do that again. In other cases, someone else tells you – hey you did that, and you think, I guess that’s right. These present, messy, lived experiences are starting to look like the “free conscious activity” that Marx argues is a part of our species characters. The above discussion on agency can help to explain the different experiences of the people who spoke with us. People in formal VET and AET programs were, by and large, situated in social fields in which rules, norms, and expectations were defined by others; they were defined by others and by what they could not do (i.e., academic failures, apply here); they were in spaces which demonstrated and reinforced structural and material inequalities in society and social relations and which were oriented toward neoliberal- and market-oriented (individuating and dehumanizing) conceptualizations of agency, human potential, and well-being. Given these conditions, is it any wonder that many people physically leave or psychologically tune out or, alternatively, exercise some form of voice, or resistance, that reflects their lack of belief, or unwillingness, to buy into the dominant model (Giroux 2001)? A capabilities perspective, if located within a system and social reality framed by the dominant discourse, would appear to provide the same result as human capital approach: agency is defined in terms of responding to market logic, capabilities are defined and valued by capital, and human needs, values, and our ontological characteristics are token “priorities” which are bent toward and subsumed by the capital’s demand for efficiency and profit. Embedded in the dominant discourse, a capabilities approach proves at best irrelevant and, at worst, harmful for a large share of people in poor and working-class communities. Formal institutions of education, largely refracting social and economic reality of late capitalism, enforce a particular, and particularly narrow, understanding of human potential and human agency. A broader exploration of human agency and human potential requires that we look further. These reflections return us to the Emerging Voices 2 research. People making a life outside the market found new ways of organizing human production and learning, which narrow (or eliminate) the (artificial) space between knowledge, lived experience, and practice. Importantly, this different set of conditions required action (labor) that was more directly connected to its use-value (meeting human needs) as opposed to its exchange value. People who were making a life appeared to demonstrate, and act, with an agency-freedom not common within market logic spaces. Instead of focusing on or perceiving of themselves as passive victims (or beneficiaries) of structure, people had articulated and were enacting a new way for making a life (Powell). People talked about freedom from oppression of capital: the importance of “having a skill” so as not to depend on an employment to get by, being able to grow their own food (which was better, cheaper, and more readily available than that from the market), of preferring to oversee their own small shop, and of caring and support activities. Each is an expression of agency, unfolding in response to lived experiences and human need. The making a life framework broadens the conceptual and practical space for thinking about and acting on agency. This matters because (partially complete) interpretations of social reality, in defining the oppressed from the perspective of their oppressors and dominant understandings of human development and well-being, place too great an emphasis on structural constraints and the implications of their removal. Too great a focus on this particular (elite) conceptualization of structure may prematurely foreclose exploration of human agency development – the ‘heterogeneity’ and ‘doing’ – that Holloway sees in interstitial spaces. The creative, humane, and life-affirming examples of “making a life” people shared with us suggest a need to place greater emphasis on and take more seriously the issue of human agency. I argue that educators and scholars ignore structuralist critics who mostly emphasize what is not possible within a predefined and restrictive model of social relations, step outside of capitalist spaces and logics, and do whatever is in our power to promote the unprescribed and undifferentiated expansion of human agency and thereby the unfolding of human potential. To date, few efforts have been made to conceptualize how human conditions of concrete labor and interdependence, conditions manifest within and beyond the capitalist structuring of society, could be drawn on to extend understandings and applications of capabilities approaches in technical and vocational education and training (TVET). This chapter has drawn on empirical research and a making a life framework to share some reflections on the application of a capabilities approach to VET. People we spoke with, most of whom did not have formal sector jobs and many of whom lived in circumstances of poverty and hardship, offered a framework for making a life that fundamentally contests core assumptions embedded in dominant discourses about the purpose of education and the relationships between education, labor, and making a good life. Based on this research, this article claims that education “harms” a large number of people that human agency is contorted and made inhumane through market-oriented systems and that new application of a capabilities perspective, and particularly of human agency, could draw on the observations of human nature evidenced in the making a life model. This initial work offers a starting point for further research and theorizing. It is important to continue to make an argument that the “making a life” conceptualization matters. In our research, we justify this approach by observing the large (and growing) number of the global working population living outside the market and of the extent to which the proposed framework reflects their lived experiences, inclusive of connecting nonmarket model labor to humane impulses. As noted earlier, people’s work and life were not only about securing their livelihoods but also involved a prefigurative element in which they actively and purposefully sought to create a new society beyond the mainstream economic logic (Baatjes 2018; CIPSET 2018). In this article, we connect this framework to an understanding of agency expansion – however, applications are not limited to theorizing new directions with a capabilities approach. This article closes with a word of skepticism on the extent to which formal VET can actually truly promote concrete labor and radical humanism. In our research, formal systems appear to be so completely enmeshed in neoliberal logic and structures of power that they will inevitably reshape humane and agentic impulses in the direction of capital. In the absence of structural shifts in the labor market and society, there may not be sufficient resources within formal VET to support such a paradigm shift. Thus, for the time being, clever educators may need to continue to look for interstices and the misfits within, against, and beyond their own institutions.